With the proliferation of Kickstarters for miniature companies has come the unending need for stretch goals. When I say stretch goals, what I think people really mean is ‘freebies’. Fair enough, you might say, there needs to be some kind of incentive for people to put up the cash to enable miniature companies to accelerate their releases etc, and I agree. Where people lose me is when they start complaining about the nature of these freebies. It appears that most of the loudest moaning revolves around the fact that what they really want is free miniatures and that nothing else will do. Talk about looking a gift horse in the mouth! I was having a discussion about stuff like this a while back with someone who was about to launch a KS campaign and we were talking about other goodies like stickers and posters etc. 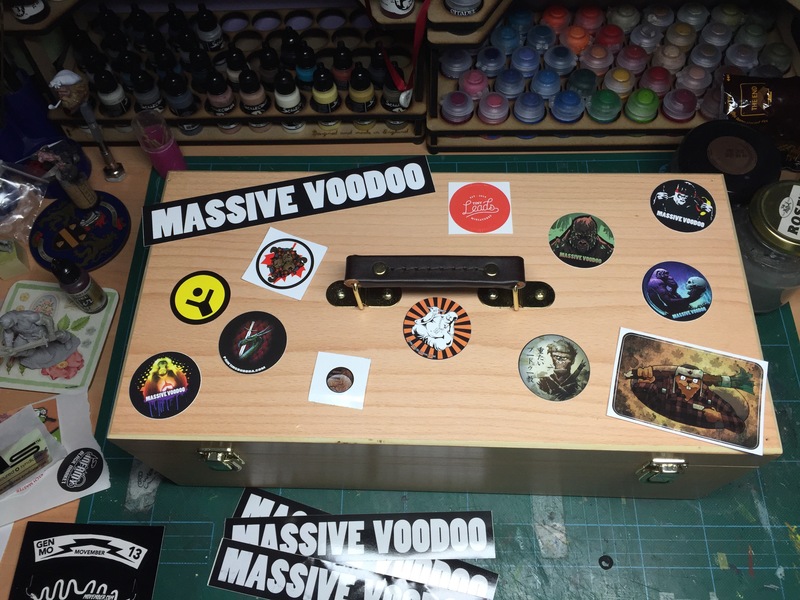 I was saying how much I like stickers as a promotional freebie, but he was really not sold on the idea, especially not as part of a kickstarter…. Here are a selection that I have been gathering over the last couple of years. 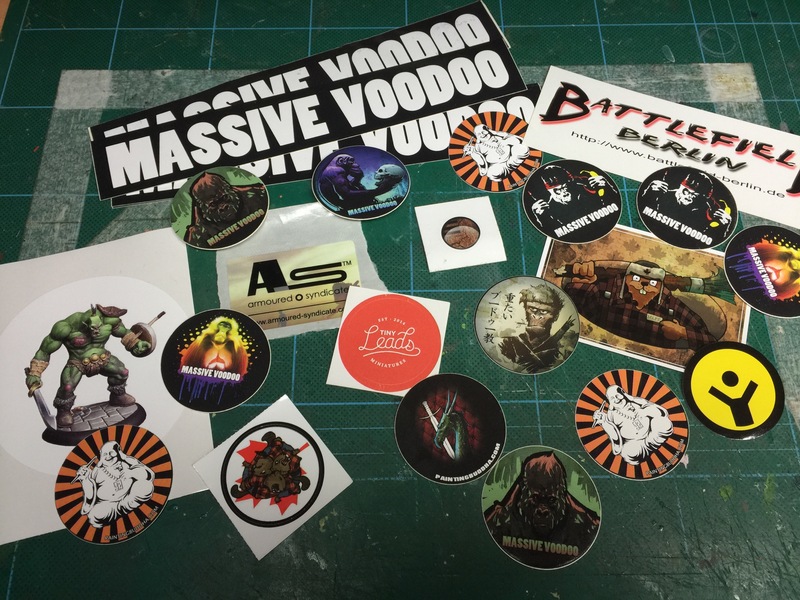 As you can see, lots are from Massive Voodoo and Painting Buddha, but they are not all German companies 😉 We do have some Brits, Spanish, French and Canadian (via Basingstoke) stickers in the mix! And what do I intend to do with these little works of art? Stick ’em on a box! 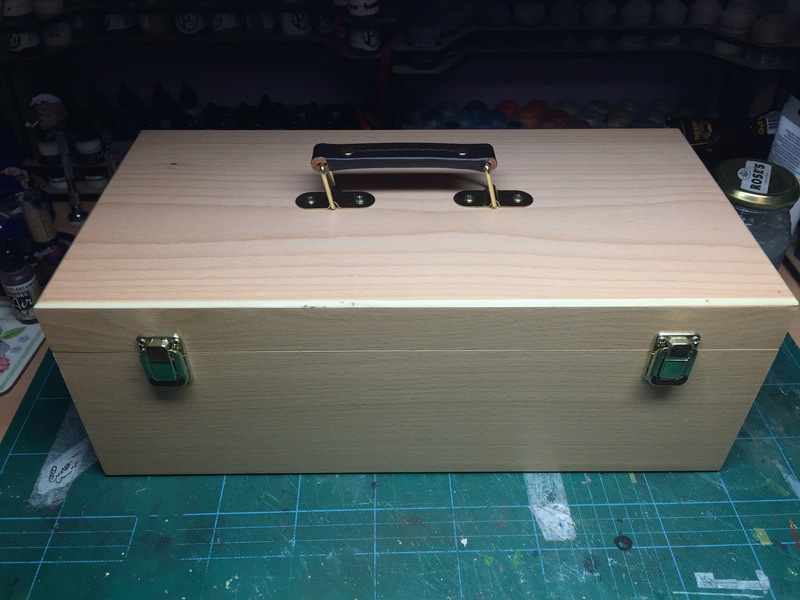 Below is a box that I recently picked up to have as a mobile paint box which I will be able to take to events and have everything inside to set up and paint anywhere. As you can see it is a bit plain and boring, but with a bit of imagination and lots of stickers it should become epic! It’s little fun things like this which is why I like it when companies make stickers – it really helps you remember them and think that as a marketing point, that’s exactly what they are meant to do. “character” – that’s it precisely! And the more the merrier!